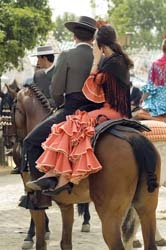 In origin a cattle fair, the Seville April Fair is nowadays the main and most cherished festive event of the pearl of the South. Jump on your carriages and dive into the fun! The Seville April Fair is the name given to the marquee tents and funfair that are installed every year in Seville's Fair compound two weeks after Easter. It is a central celebration in the life of the city, and one of the most idiosyncratic examples of the Andalusian folklore and traditions. The celebration lasts for six whole days, starting on a Monday night and lasting until the next Sunday. The history of the Seville April Fair started the 25th of August of 1846, when two ranchers-businessmen (Narciso Bonaplata, of Catalan origin, and José María de Ybarra, Basque) that lived in Seville asked the local authorities for permission to celebrate an annual cattle fair during three days of April. After some riff-raff, they obtained the permission from Queen Elisabeth II herself, so that 1847 was the first year that the Fair was celebrated in the Saint Sebastian fields, in the outskirts of the city (today it is a quite central spot next to where the University and the Plaza de España are located). It consisted of 19 marquees, and it was such a huge success that in 1850 there had to be a separation from the cattle area and the festive area. In 1896, an iron structure resembling a footbridge was installed, which served as an overpass for the fair, with a kiosk in the middle of the bridge that was lit with white light balloons at night. When this structure had to be taken down in 1921, the Fair's organizers decided to create a structure in its memory each year that served as an entrance to the compound. This is how the famous facade of the Fair, an enormous structure packed with light bulbs, was born. Also on that year the Fair started to be what it is today: an ephemeral artificial city for a week of pure fun. The starting point of the Fair is the known as the Night of the Pescaíto (small fish), a fried fish dinner before the millions of light bulbs on the facade and the Fair's streets are lit and the celebration officially starts. One week later, on Sunday night, the party comes to an end when all the lights are shut down and there is a big fireworks spectacle to top it off. A basic element of the celebration is the wide offer of culinary delights that can be tasted all over the marquees and in the funfair next to it. As we said before, the Fair itself is openened with a culinary event: the Night of the Pescaíto, where fried -and fresh- fish are consumed before the light bulbs are lit and the party starts. As well as fried fish, there are many other small appetizers that can be enjoyed at the Fair's marquees, such as Iberian ham and other meat products, salmorejo (a typical cold tomato soup), scrambled eggs, or the famous Jerez prawns. There is also the tradition to cook a big stew dish in every marquee for lunch time, where the hungry visitor can find potatoes with cuttlefish, chickpeas with cod, and an endless variety of "spoon dishes". There are also many stalls selling hot chocolate with churros (fried pastry with sugar on it) or buñuelos (a sort of Spanish donuts). In the drinks section, the star is the manzanilla, a typical sweet wine from Andalusia, that can be mixed with soda and is then called rebujito. Despite this fame, the official (and dryer) drink is the fino from Jerez. 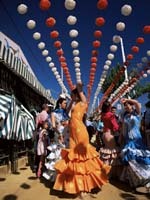 The Sevillanas are the typical song and dance of the Seville April Fair. Its origin dates back from before the times of the Catholic Monarchs, and they deal with many subjects and themes. The dances can also be slow or fast dances, and group or couple dances. The women usually dress the typical faralaes dress (a strong coloured dress with white dots on it), which is a reminiscent of the early years of the Fair when the women of the ranchers would accompany them in their work robes, slightly touched up and decorated for the occasion. The carriage is the typical means of transportation of the Fair, and the only one allowed inside the compound. These carriages were traditionally used to show economic status, and often competed with each other in garments and decoration to be the most beautiful of the Fair. For this matter, a parade is organized every day at midday that is nowadays an eye-catching spectacle one shouldn't miss. This is the name given to the funfair that's built next to the Fair compound, and in which all sort of mechanical attractions are available for the children (and the grown-ups, too!). With more than 100 attractions, Hell Street is the biggest temporary funfair of Spain. Being a celebration that originated from a cattle fair, bullfighting is a central element of the festivity. For two weeks -the week of the Fair and the previous one- there is a bullfight everyday at around 18:30, to which the personalities and celebrities of the city usually assist to on carriages. A triumph in Seville's bullring is the highest prestige for a bullfighter. When the sun sets, and all the light bulbs and lamps are lit, the joyful night of the Fair begins. This is the time for socializing, drinking and dancing (even though this also happens throughout the day), and people are more relaxed and friendly, maybe due to the effects of the drinking, too. There is a typical tradition which is having a warm cup of clear soup with a mint leaf to regain forces and temper the body. The night goes on until around 3 in the morning, when the lights are turned off and the people go back to rest to get ready for the next day's frenzy.